A Quiet Movie. Mildly disappointing in the same way as Deep Blue Sea – Davies casts some of my favorite actresses, and they’re wonderful in his films, and his use of light is simply the best, and there are some very nice words in the dialogue (like “pillory”), but it all seems kinda polite and I never connect emotionally in the way I feel I should. Much better than Sunset Song, anyway. An episodic biopic of the life of Emily Dickinson (Cynthia Nixon), with sister Jennifer Ehle (the only good part of Contagion), brother Duncan Duff, and friend Jodhi May (Nightwatching). Spoiler alert for a Terence Davies movie: her heart is full of poetry and yearning but her adult/love life doesn’t turn out very happily. After an intro sequence where her family is played by younger actors, the movie changes eras, zooming in slowly on each character one at a time, and I was horrified to realize it was morphing the faces of the young actors into the old ones, a technique that I thought was abandoned soon after Michael Jackson’s Black or White video… but a couple seconds later I realized it’s really beautifully done here, and even again at the end, in the biopic-obligatory credits shots where they show the lead actor vs. the real person they’re portraying. The dialogue gets exasperating, but I could watch the actors do their thing forever. Davies has always been as precise with time as Dickinson was with rhyme, and that ineffable sense of rhythm defines several of the standout sequences … The movie is defined by its staccato phrasings, elliptical flow, and opaquely confessional nature … She could have found a husband and moved out, the film suggests, but being a married woman in the 19th Century would have robbed her of what little creative control she was able to maintain over her own life; after all, she had to ask her father for permission to write, and she only did so in the dead of night, when everyone else was sleeping. 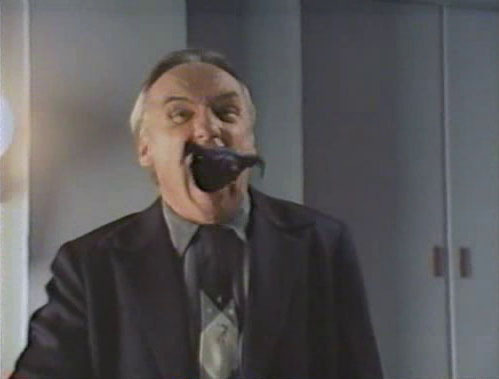 Davies has said that, “Having your work taken away from you makes you feel like a non-person,” and just as Dickinson couldn’t stand an editor so much as moving a punctuation mark out of place, the filmmaker is too sensitive to survive the destruction of trying to move beyond his comfort zone. Nice enough TV-movie with some good performances and a great premise: a noir detective story in a world where magic exists. Our hardboiled hero Lovecraft (Fred Ward, the year after starring in Henry & June) who doesn’t use magic due to an incident that killed his partner is hired by a rich guy (David Warner, an HP Lovecraft fan judging from his IMDB resume) to retrieve his Necronomicon. Ward runs into ex-flame Julianne Moore (this might count as her first starring movie role), tries to avoid thug Raymond O’Connor and his zombie, and finally protects Warner’s unicorn-hunting daughter from Warner’s own convoluted world-dooming scheme. When I heard Schrader had made a sequel starring Dennis Hopper, I couldn’t get a copy fast enough. Unfortunately it’s such a bad movie, it makes me wonder if I didn’t severely overrate the previous one by calling it “nice enough”. This one has fewer puppets, more early (too early) digital effects. And I love Hopper, but he doesn’t seem right for the role, speaking too slowly, looking out of his depth. Eric Bogosian (writer/star of Talk Radio) is a slimy anti-magic senator, starts a literal witch hunt by arresting and arranging to burn Hopper’s witch neighbor (now played by Sheryl Lee Ralph of To Sleep With Anger) for defying “the unnatural activities act”. I don’t know if this is a prequel or what – Hopper has different reasons to avoiding magic than Fred Ward did, and Raymond O’Connor’s zombie is back from the other movie. Penelope Ann Miller (Edna Purviance in Chaplin) is love interest fatale “Kim Hudson”, there’s a movie-star lookalike whorehouse a la L.A. Confidential run by a transvestite lipsync artist, more characters with obvious names (a cop called Bradbury), and Julian Sands with a heavy fake accent. And morphing – remember morphing? The first couple minute are nice though, with clips from 1950’s industrial films recognizable from MST3K and a reference clip of Reagan testifying before HUAC.